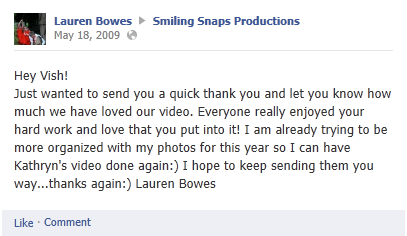 Smiling Snaps completed its 10 years last year. Double digits! I was thinking of how I started almost 10 years back. My friends and family helped me spread the word about my work. My husband worked late nights with me, helping me figure out every little detail. He is my biggest critic and my strongest supporter, even today. My kids at two and four years then, knew they needed to be quiet when I was on the phone. My clients have consistently shared positive reviews on Facebook and Google and let me know how much they love my work. I cannot thank them enough for sharing the experience they've had with Smiling Snaps, with the world. Just for fun, I thought I'd share the first review I received on Facebook. Enjoy! It is great keeping up with the trends and making sure my slideshows include the current vibe. Celebrations, especially weddings, have a different trend every year and it is interesting to make sure that the style is represented in my work. Every Slideshow is totally custom made and set to music elegantly with sophisticated special effects. I love including new artwork and styles to my collection, and creating new special effects. It keeps me on my toes, and it keeps my work looking fresh and crisp. Thank you and Keep Smiling with me!